Sepia studio photograph of Kenneth Mackay 1895-1960. 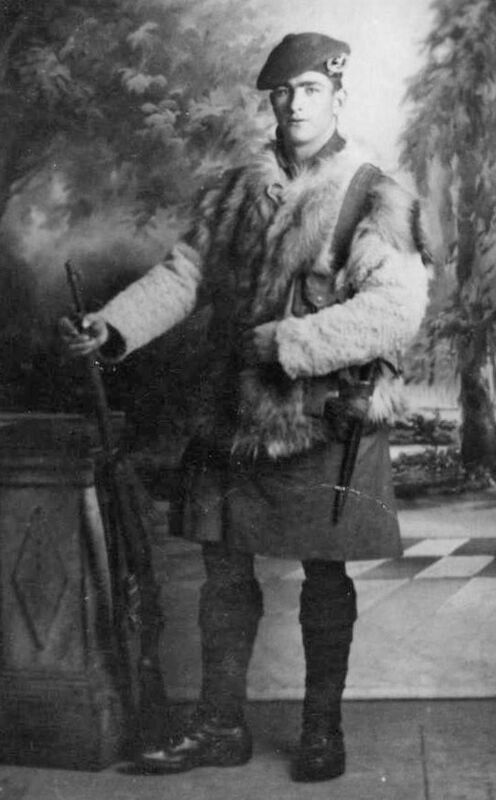 Taken in 1915 in uniform with fur jacket. He resided at 3 River Street Dornoch and was employed as a journeyman painter and decorator. Served in France with the British Expeditionary Force (BEF). Display board photocopy catalogued as 2003.242.001 Piece of paper in with the photograph has the above information and includes specific dates of birth 10/08/1895 to 29/05/1960. He served with the 5th Battalion Seaforth Highlanders from 1915 to 1919. The photograph is dated 17/12/1915. Photograph is a copy of original.